Bicycles are a treasured possession for many experiencing homelessness as they provide vital transportation. A properly functioning bicycle can mean the difference between working or not. Making money, or not. Pablo’s bicycle was having a rough spring. The wheels weren’t in alignment and the brakes didn’t work. 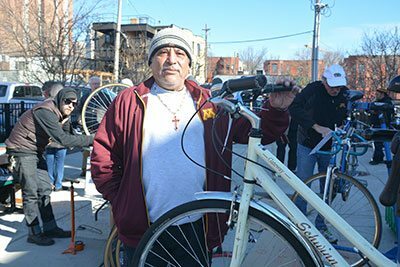 When volunteers from Rydjor Bike Shop, the Hub Bike Coop and Spokes/Cycles for Change came to Catholic Charities’ Opportunity Center this spring, they fixed up Pablo’s Schwinn. His wheels were trued, his brakes adjusted and Pablo was given the gift of a helmet. At the bike repair clinic event, nine volunteers repaired 24 bicycles. “These people, I say thank you for everything,” he said. Pablo spent four years on the streets, but, because of your support, the 58-year-old has an apartment to call his own. “Catholic Charities is a good place. It helped me with everything, such a good place,” he said. Every day, when his bicycle works, Pablo rides from his apartment over to Opportunity Center so he can eat breakfast and talk to friends over coffee. When he leaves Opportunity Center, he looks for work he can do. Some days, he’s a mover, some days he does landscaping work, sometimes painting. He has been in his apartment for one year, and he hopes to stay there for a long time. “All the time, my apartment is clean. I don’t cause any problems. I don’t want to lose it; I don’t want to go back to the street,” he said. “Now, I’m happy. Thank you. Thank you for everything.